No one with the real City of Saint Louis has a sense of humor. The heck with the rifle. Those things are sharp and pointy on five out of six corners. It isn’t the sort of “wiggle room” they would have you think. But Cunningham says the motivation for the change is to give officers a little more wiggle room when faced with a threat. 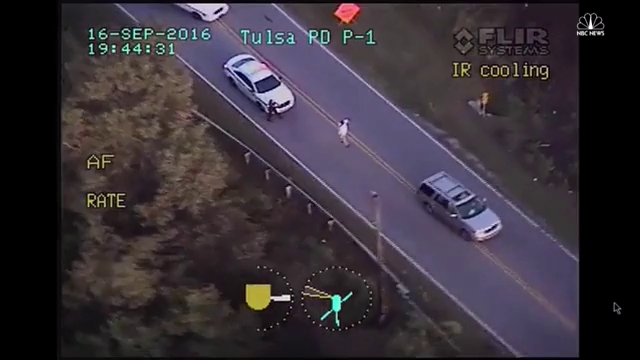 [Tulsa Officer Betty Shelby] first saw Crutcher’s tan SUV, which was parked in the middle of a two-lane roadway with the windows down. As she was peering inside the car, she turned around and saw Crutcher approaching her. Oddly, the video shows her near the police car, not the SUV, with Crutcher between it and his SUV. Then, Crutcher put his hands up, without receiving instructions to do so, which she thought was strange, Wood said. The last time the cops came up on me from behind like I certainly raised my hands. Since the video appears to show her pointing her sidearm at him, I’m not surprised he raised his hands. She believed he was reaching into the car to retrieve a weapon. For now, assuming no photoshopping, that does appear to show a closed window. Note the reflection, as well as the dark streak extending down the window and continuing down the door. If it can be shown that the image the family displayed has been faked, I’ll revisit my opinion. Nota bene: My image here is a crop of a video still of the displayed image; I did enhance brightness and contrast and added the colored oval. I did not other alter the image. If I were in Oklahoma, I would now be ineligible for jury duty for any trial related to this. 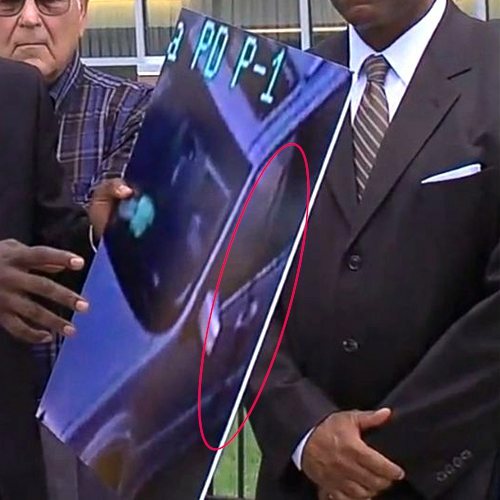 If the lawyer’s assertion of his client’s claims are correct, then she lied about 1) her position, 2) that Crutcher walked up on her, 3) that he raised his hands for no reason, 4) that the window was open, and 5) that he reached into the “open” window. Well, I’ll let you decided what the combination of shooting and lying about it suggests. I’m going to give him benefit of the doubt and assume that he broke rule 2 along with the others. Sources told NBC Bay Area that Gaines brought the handgun, a 22-caliber “baby” Glock, to work and was apparently not familiar with how it operated. She handed it to Santos and asked him about its use, sources said. The second deputy pointed the weapon at the first deputy and – apparently unaware the weapon was loaded – pulled the trigger. The round missed the her, piercing an equipment storage cabinet, before lodging in the office wall. That wasn’t an “accidental” discharge. It wasn’t even negligent. He meant to point the gun at a person and pull the trigger. Thank Ghu he demonstrated standard NYPD-style LEO marksmanship. A “22-caliber ‘baby’ Glock”? Aside from the missing decimal point, what the hell does that mean? I’m not a Glock guy, but isn’t the model 26 (9mm) the one that gets called a baby Glock? If it’s a Glock 22, they’ve got the caliber wrong (I once had a cop come in the store trying to buy “22 bullets” for his “law enforcement gun;” he had a Glock 22 and had no ideqa what ammo it ate, he just put in preloaded mags from the department armory). Huh. Maybe it had the .22 conversion kit. Officials said the shooting happened near the end of a counter-drug training mission for state police. Part of the training involves approaching civilians and talking to them. When a state trooper walked up to one man at the bus station, the man pulled a gun and shot the officer at close range, officials said. The officer has since died and the gunman is also dead. WTF are the cops doing running a “training exercise” in a working bus station filled with civilians who don’t know they’re participating? And why would the cops be using live ammo for an exercise with civilians? I really want to see some surveillance cam footage of how those cops “approached” the shooter, along with what they were wearing. Updated speculation: As you can see above (and from various stories), originally it wasn’t specified that the officer who was shot was in uniform. The confusion over who was shot (two officers and a female civilian and the shooter, then two officers and two civilians, then one officer and two civilians…) made me wonder if they had trouble sorting cops and civilians because the officers were in plainclothes. That could be significant in figuring out the shooter’s motivation; was he concerned about a pushy guy in civvies trying to grill him? Or did he have some reason to fear arrest? An “identifiable outfit”? Why not just say uniform. Odd phrasing, that. Now I really want to see surveillance footage. Was the cop in plainclothes except for a raid jacket with “Police” across the back?